Reflexivity is a social theory dealing with the circular relationship between cause and effect. It occurs when the observations or actions of observers in a social system affect the very situations they are observing. A simple, often referenced example of reflexivity is how an anthropologist living in an isolated village may affect the village and the behavior of its citizens that he or she is studying. George Soros famously promoted his understanding of reflexivity as a major factor contributing to his successful financial career. For nearly 30 years, Soros ran one of the most successful hedge funds in history, the Quantum Fund, and amassed a fortune of nearly $25 billion. Soros described his view of reflexivity in the 1987 book The Alchemy of Finance. The book is interesting but tailored to the academic. It is dense! While reading it I remember thinking that I wasn’t smart enough to understand what he was talking about. In many ways, I still think that’s true. Soros is on another level of intelligence so following along with his stream of thought can be almost impossible for “normal” people. Still, the broad takeaways from this book as they relate to financial markets and reflexivity are massively important. Nerd alert! While doing yard work over the past month, I haven’t been listening to Bieber or Drake’s new album, but have been listening to Ben Bernake’s book, The Courage to Act. Laying mulch while getting backroom details of Federal Reserve negotiations during the financial crisis is a great way to spend an afternoon. 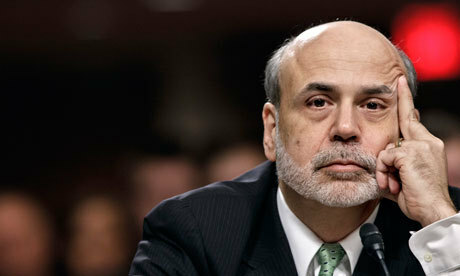 Hearing Bernake give a detailed, insider view of the financial crisis is fascinating. Every pundit, analyst and journalist seem to have an opinion as to what the Fed should have done or what they should be doing now, but if reading this book has taught me anything, it’s that the Fed is in pretty good hands. Joe Stock Market Analyst and Sally the Journalist probably don’t have a clue. Bernake’s memoir not only offers tons of great examples of emotions driving market reactions in times of crisis, but there are also some really cool instances when reflexivity became a big consideration in policy discussions. Under normal circumstances, when a bank has trouble meeting short-term liquidity needs (can’t find a willing lender), it is allowed to borrow directly from the Federal Reserve. 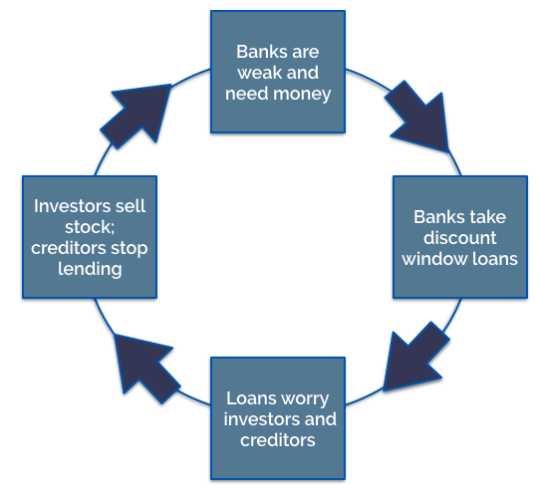 This type of borrowing comes from what is known as the discount window. The Fed is supposed to be a “lender of last resort” and they discourage banks from abusing access to these funds by attaching a “penalty rate” to the loans. Because most banks with strong balance sheets rarely have trouble securing short-term loans on the open market, borrowing from the discount window comes with a certain stigma. A bank that accesses the discount window may be perceived as weak. See the predicament? I think the concerns of people in charge of the banks were certainly valid. It’s a tough position to be in. Despite their intent, bank executives had to consider how market participants might interpret their actions. This is a common theme throughout Bernake’s entire book. He constantly had to consider how Fed actions would be interpreted and how those interpretations might affect the market. If the Fed and the banks could operate in a fundamental vacuum, the financial crisis would have been a lot easier to contain. In the real world though, that isn’t possible, and that’s why these guys have such a tough job. Assets are not priced based on economic data or business fundamentals. If they were, there would be no need for markets. Market prices reflect the perceived value of an asset based on all available information. This perception is heavily influenced by exogenous factors such as investor sentiment and human emotion. Because humans are prone to irrational behavior, their actions and emotions are fairly random. Beyond the impact of emotion, markets are also highly susceptible to the butterfly effect. This makes reliable prediction of a globally interconnected economy nearly impossible. These simple facts are magnified greatly when taking the short-term view. My advice, as always, is to avoid it. Take a long-term view and don’t waste time trying to predict the unpredictable. That’s a game that nobody can win!